In need of lorry door seals? You're in the perfect place - JA Seals offers the 21mm Lorry Door Seal, which is a PVC / rubber door seal manufactured from a rigid PVC with a co-extruded PVC/Nitrile rubber, making it perfect for use as an automotive rubber seal for truck doors of many sizes. 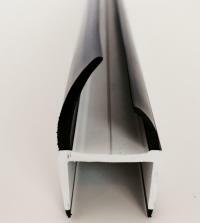 This Lorry Door Seal is available in 3m lengths, off the shelf to your door. Our truck door seals can also be produced to order, if required. Please email or call to discuss any bulk door seal requirements.